Civil Defence battledress blouse - worn by Eton schoolboys. Note different breast pocket badges. 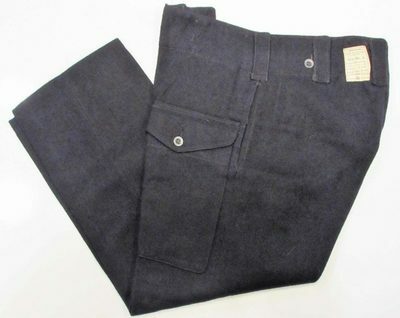 Issued to First Aid and Rescue Parties in February 1941, the very dark blue ARP Pattern 59 Battledress Blouse (Rescue) and ARP Pattern 60 Battledress Trousers (Rescue) were of an identical cut to the Army pattern BD. 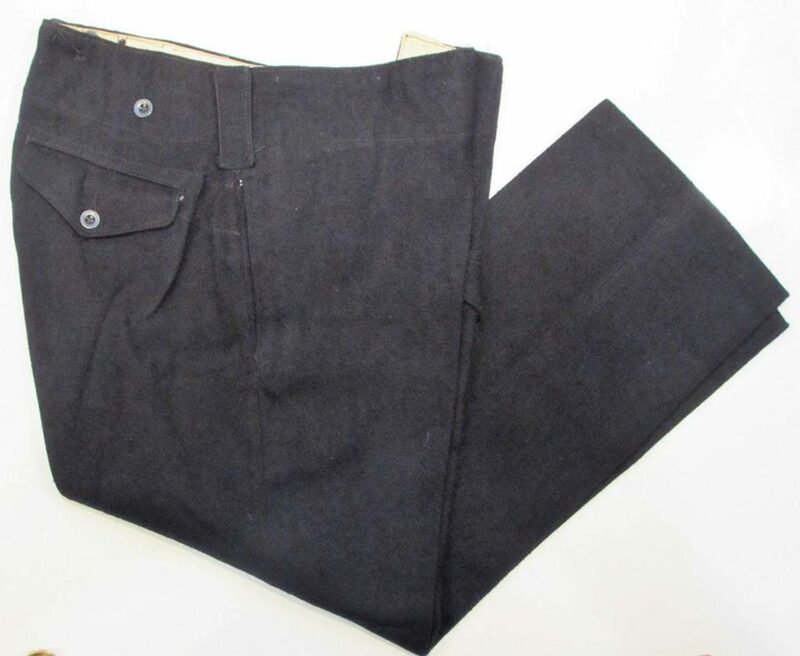 In July of 1941 the same two-part uniform was issued to men in other Civil Defence services (ARP Pattern 57 Battledress Blouse and ARP Pattern 58 Trousers made of a slightly lighter weight cloth). Regulations stipulated that junior ranks wore the BD with the neck closed. Senior ranks could wear the jacket open at the neck with a light coloured shirt and dark blue or black tie. 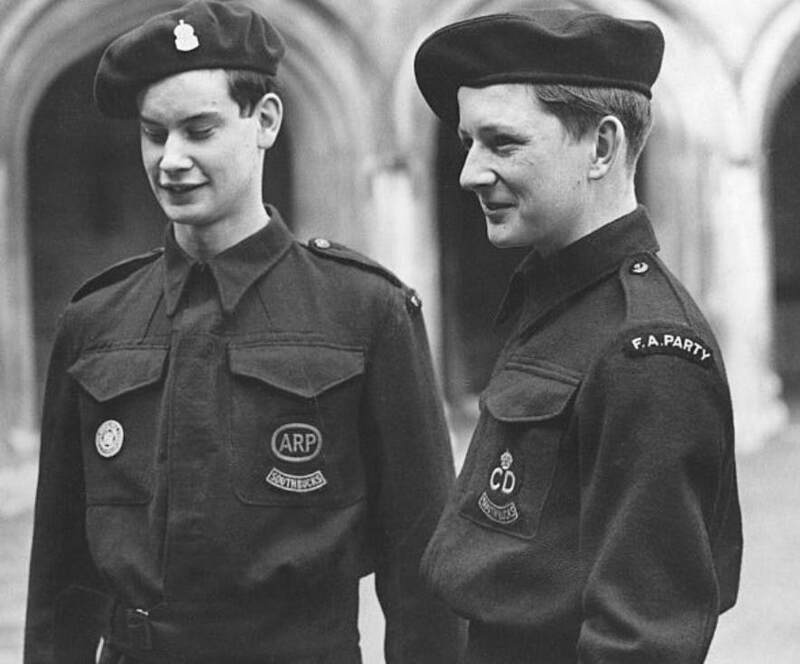 A wool beret (ARP Pattern 68) was also available to which most attached their silver ARP badge. For newcomers to the Civil Defence services a base metal ARP badge was manufactured during the war until replaced with a small CD badge (ARP Pattern 98) for the beret. Two distinct patterns were issued, easily identified by either having buttons exposed or not (austerity versions had an 'A' added to the ARP Pattern). The markings from the War Department related to the year: P=1941 O=1942 N=1943 M=1944 L=1945. The epaulette buttons were unmarked black plastic revolving shank buttons (later post war blouses often have small black CD-marked buttons). 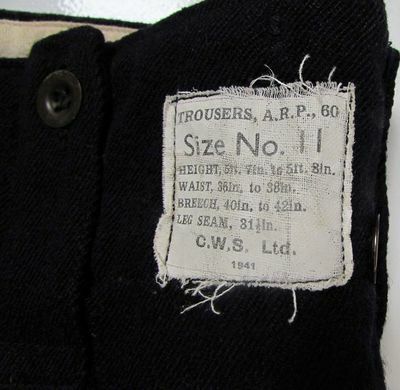 See a list of all uniform sizes. 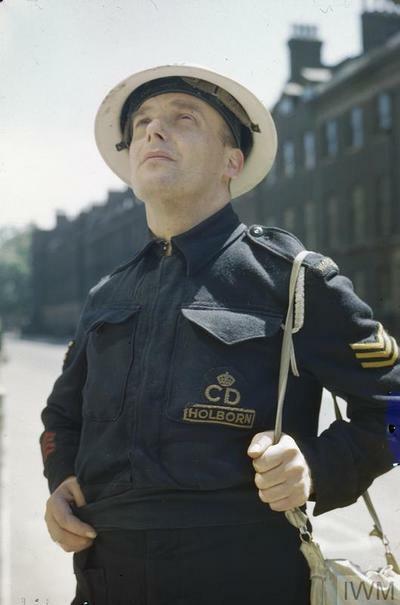 Original WW2 photo of a Head Warden (three yellow chevrons) in Holborn wearing battledress. The battledress jacket/blouse featured two large breast pockets with pocket flaps. A buttoned epaulette was on each shoulder. The centre front opening fastened with five buttons and a neck hook at the throat. The waist had an integral belt-type fastening allows for adjustment. 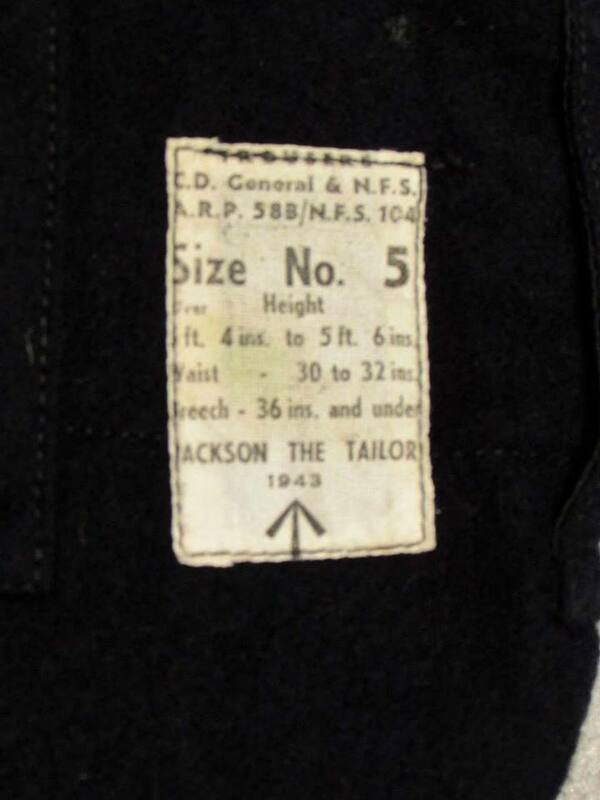 The edges of the jacket pockets were lined with grey (sometimes blue) cotton drill. The jacket could be buttoned at the rear to the battledress trousers. For more information on ranks see this page. Serge battledress trousers were manufactured to go with the BD. Pattern 59 was made for the Rescue services and Pattern 58 was for general distribution across Civil Defence services. 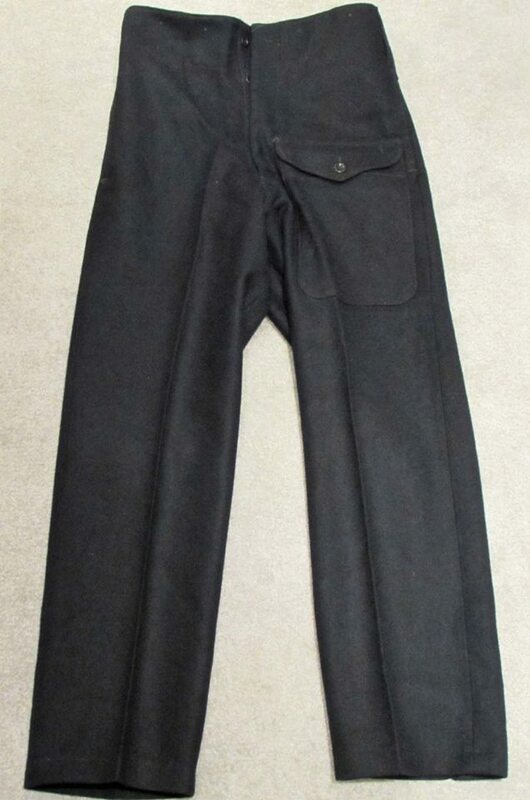 Much like the army BD, the trousers featured two slant pockets, a rear buttoned pocket, a leg pocket on the leg and a bandage pocket on the front right. 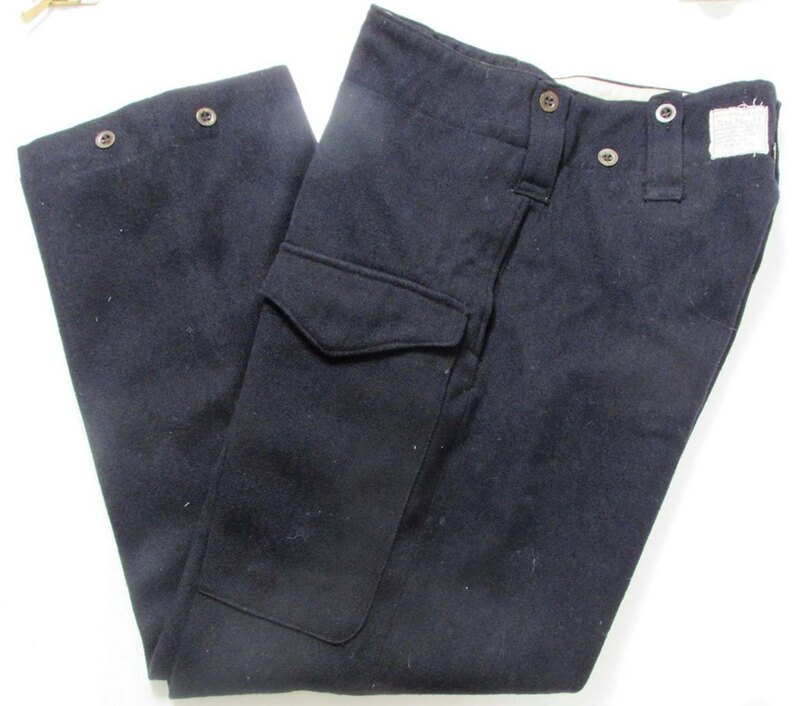 Buttons on the rear waistband allowed the BD blouse to be buttoned to the trousers. Pattern 58A were austerity pattern. ARP Civil Defence Trousers Pattern 58B (front). 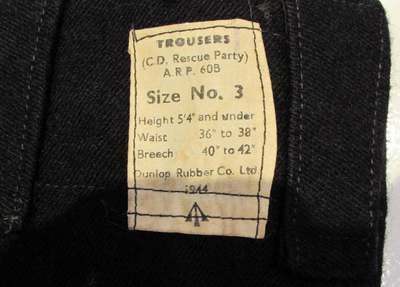 ARP Civil Defence Trousers Pattern 58B (back). ARP Civil Defence Trousers Pattern 58B (side). ARP CD Rescue Party Trousers Pattern 60B. 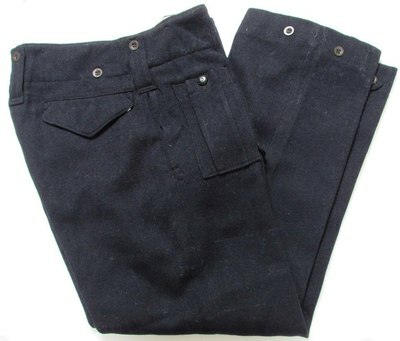 ARP CD Rescue Party Trousers Pattern 60B (left). 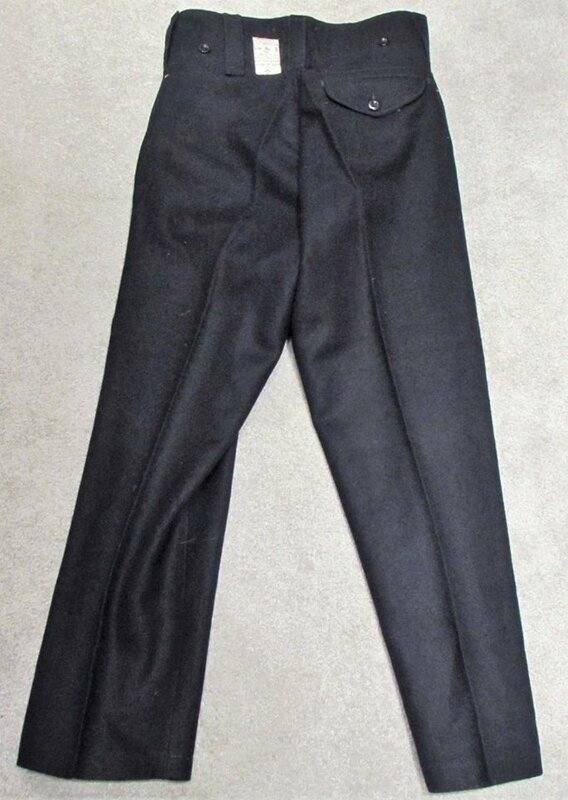 ARP CD Rescue Party Trousers Pattern 60B Label. ARP Pattern 71 jacket and Pattern 73 slacks. 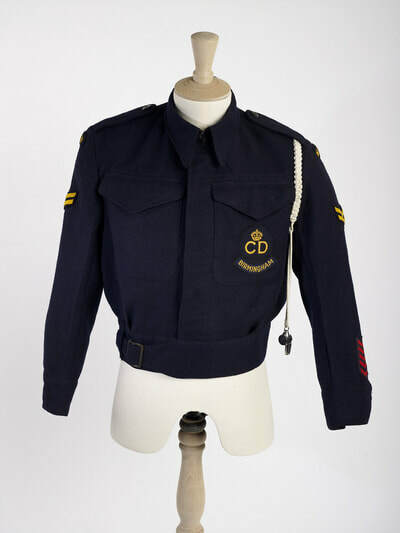 A single-breasted serge tunic / jacket in the same dark blue material as the men's battledress was manufactured for female members of the Civil Defence services. 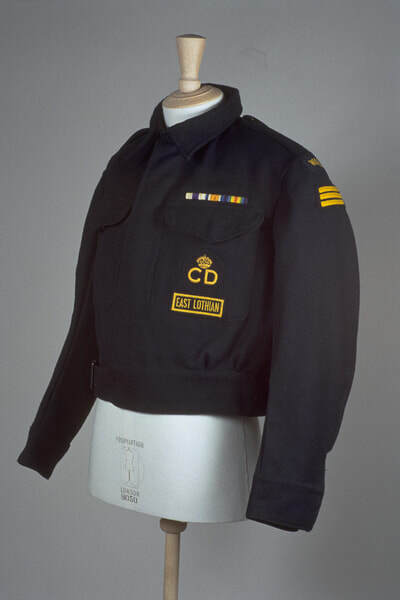 the front was fastened with white metal CD and King's crown buttons (replaced by black plastic buttons later in the war) and a belt and buckle (early war tunics have a simple slide through buckle; later war tunics featured a chrome buckle with two prongs similar to the RAF tunic buckle). ARP Pattern 73 Slacks and ARP Pattern 72 Skirt (see below) were also produced in the same material to go with the tunic. WW2 ARP Tunic Pattern 71 Women's Civil Defence serge jacket (front). WW2 ARP Tunic Pattern 71 Women's Civil Defence serge jacket (left showing CD badge on breast pocket). WW2 ARP Tunic Pattern 71 Women's Civil Defence serge jacket (right side showing Warden shoulder title). Men's (ARP Pattern 69 & 69A - austerity) and Women's (ARP Pattern 70) overcoats or greatcoats were available. Most authorities allowed the wearing of shoulder titles and rank insignia to be worn on overcoats and greatcoats.